When hair stylist Hullema Reddick goes outside, she's covered from head to toe in traditional Muslim garb, with nothing showing but her eyes. Inside her salon, Hstylze, it's a different story. There, when she is in the presence of only women, she can trade the hijab for jeans, jewelry, and makeup as she dyes and styles hair, helping women boost their confidence in an environment free of men. Admittedly, it's been challenging growing a business built on beauty when potential clients can't see what she looks like beneath her niqab (face covering). Still, Reddick's East Falls shop is thriving. She is booked solid until September, has garnered attention for her work, and boasts more than 31,000 Instagram followers (@Hstylze). She often goes by her nickname, "The Covered Colorist." "I think they're more interested in the coloring, the fact that it's a Muslim who's coloring hair," she said of her followers. "We can't see her, but she's putting out all this good work. It's pretty different." Reddick's shop is one of a growing number that serves women of all races and faiths, but it has become especially important to the city's growing Muslim population, which has swelled to 200,000 in recent years. Some Muslim women believe men who are not related to them should not see them without their Islamic attire because the Quran tells women to guard their modesty, said Kayla Wheeler, a visiting scholar at Boston University who researches black Muslim fashion. But the women still enjoy getting their hair colored and cut. "They still want to look pretty," Wheeler said. Salons like Hstylze provide the privacy that allows women to relax and uncover as they have their hair done without the risk of males entering their space. "There's nothing worse as a Muslim woman than a guy that comes in to the salon and starts selling CDs or a mailman that stays a little too long," said Aliya Khabir, 38, of Hunting Park. "To be able to go to a salon where you can relax and have privacy is truly important." Mia McNeely, 34, is one of Reddick's non-Muslim clients. She acknowledged that women in general don't want to be seen by men when getting their hair done. "I think that's something that every woman worries about," she said. "It's not the most glamorous process." Hullema Reddick of Hstylze Hair Studio in East Falls styles Tamikia Jordan’s hair. Sandra Baker, a Muslim client from Chester City, said going to Reddick's shop was about "more than just getting my hair done." "The atmosphere … the people that come here. It's a nice vibe," Baker said. That's exactly how Reddick wants it. "It's exciting for me," she said of her work. A fresh look can change someone's life, Reddick said, especially in cases of women who are depressed or abused. Reddick said she is a former victim of domestic abuse and recognizes troubled women when they enter her salon. They're usually shy and keep their heads down, she said. "You have to do things to uplift them," Reddick said. "One time, I had a lady … she just busted out crying. She was like, 'I didn't know I could look this beautiful.' "
Reddick said she started crying, too, and the two women bonded. 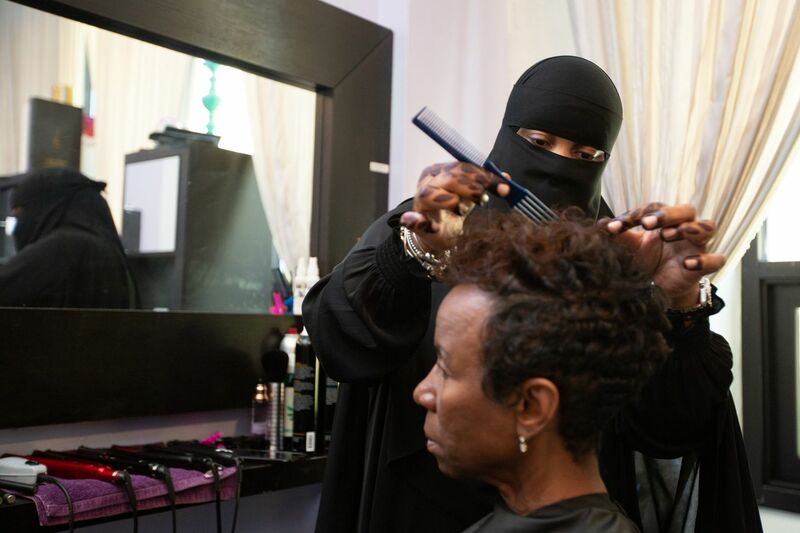 A South Philadelphia native who now lives in East Oak Lane, Reddick has been a hair stylist for 25 years and an active member of the Islamic community for 12. "She's a rare breed," said Baker, 47, who regularly travels more than 40 minutes to Reddick's salon. There, she knows the door will be locked so men cannot enter, and she can let down her hair without worry. "It's that great level of privacy in the salon. That's a plus and one of the reasons we like going there."